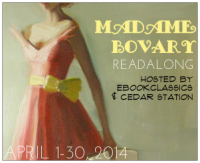 The Madame Bovary Read-along is hosted by C.J. @ebookclassics and Juliana@Cedar Station. You can also check out the posts of other participants, here on the master post. In Part 3 of the book, we witness Madame Bovary’s life falling apart. Her affair crumbles, her financial situation erupts, and her sanity becomes more questionable. At the beginning of Part 3, Leon and Emma have been reunited. While Leon was gone from Emma for three years, he had never completely given up hope that they could someday be together. Now, upon seeing her again, he vows to be “bold, and try to win her”. It made him frantic to think of the happiness they might have had, if it had only been granted them to meet earlier in life and be joined together in an indissoluble union. Situations like this is exactly why Blue Rodeo’s Bad Timing is such a classic. So, an affair between Emma and Leon began. In order to continue her affair, Emma construed a plan to take fake music lessons in town once a week. During this time, she also increased her spending, becoming more and more in debt, always hiding it from Charles. Her whole life had become a lie. Not surprisingly, their affair began with gusto, but only went downhill from there. He was prompted less by vanity than by the sole desire of pleasing her. He never questioned her idea, he concurred in all her tastes. He had become her mistress rather than she his. Murmuring tender words, she kissed his soul away. She would look forward to a profound happiness at next meeting, then have to admit that she felt nothing remarkable. What had charmed him once, now frightened him a little. Moreover, he resented her progressive absorption of his personality. He could not forgive Emma that continual conquest. He strove to stop loving her; but he had only to hear the creak of her boots and he felt unmanned as a drunkard at the sight of strong liquor. They knew each other too well to feel that astonishment in possession which multiplies its joy a hundredfold. She was as sated with him as he was tired of her. Emma had rediscovered in adultery all the banality of marriage. When Emma’s financial troubles got to the point where the Bailiff comes to take possession of her things, she became desperate. She hides from Charles, runs around town asking for help, and, having no luck, finally finds herself at Rodolphe’s house. Finding no help, even from Rodolphe, she loses all hope and runs to the chemist’s shop “in a transport of heroism which made her almost gay”. Emma stuffs arsenic into her mouth, while poor Justin watches (and will probably feel responsible for it the rest of his life), goes home, and dies. The dying is not sad, like you would expect it to be. Homais and the priest add a lot of humour to the situation with their bickering. Charles is sad, but I mostly just felt relief for him, hoping he will be able to get on with his life, but I found out that was not to be. Soon enough, Charles finds Emma’s letters from Rodolphe and Leon. He becomes very distraught, never leaving the house. One day, his daughter finds him outside, dead, clutching a lock of Emma’s hair, leaving poor Berthe on her own. Berthe gets sent to her Grandmother’s house until her Grandmother dies, then she is shipped off to her Aunt, who is poor, and ends up working in a cotton mill. I wonder about Bertha’s life and how she turns out. She has a harder life than if she had been able to stay with her parents, but not necessarily an unhappy life. We will never know, but let’s hope she ends up happier in life than her mother did. I wish I could ask Flaubert what happened with Berthe. The book ends with Homais becoming very successful. His practice grows, and he is awarded the Legion of Honour. Life goes on, as though the Bovarys had never existed. No matter, she still wasn’t happy, she never had been. What caused this inadequacy in her life? Why did everything she lean on instantaneously decay? …Oh, if somewhere there were a being strong and handsome, a valiant heart, passionate and sensitive at once, a poet’s spirit in an angel’s form, a lyre with strings of steel, sounding sweet-sad epithalamiums to the heavens, then why should she not find that being? Vain dream! There was nothing that was worth going far to get: all was lies! Every smile concealed a yawn of boredom, every joy a misery. Every pleasure brought its surfeit; and the loveliest kisses only left upon your lips a baffled longing for a more intense delight. Was Flaubert’s ultimate message about counting your blessings, finding happiness with the life and circumstances you find yourself in, instead of always wishing for more? If so, I think it is something that we can all relate to, and even struggle to remember on a daily basis. Just hopefully not as much as Madame Bovary struggled with it. Thanks to C.J. @ ebookclassics and Juliana @ Cedar Station for hosting this read-along! I enjoyed the book (which is not always a guarantee, I’m sure), and had fun ‘discussing’ it with my fellow read-alongers. I really like that final passage! It does seem to be a kind of condensed, take-home version of the entire book. The book probably could have been condensed a bit, but I could say that about a lot of books. The read-along was fun! Thanks for hosting! Oh, Bad Timing! Yes! What a great song and perfect accompaniment. Bad timing in love and in general – things would have been different had Emma been born in a time where she wasn’t married off to the first person to show an interest. I thought about how most of us have probably dated a Rodolphe type or a Leon type, or both, but (hopefully) you don’t end up with them, you chalk it up to puppy love and move on with your life. I wonder about Berthe too. Her Aunt is described a poor, but maybe loving? Maybe functional? We can hope! I never thought about it terms of time, as well, but, you,re right! I’m not sure I put that as well as you did. It’s hard to say be happy with what you’ve got without making it sound like you shouldn’t have hopes and dreams at the same time. But I guess there has to be some kind of a balance. I liked that last quote, too. It does summarize the book very well, but at the same time it annoyed me that Emma did not learn one bit. It’s not wrong to dream and to strive for happiness and a better life, but after her disappointment with three men, you’d think that she would know better than to look for yet another strong and handsome man… I really enjoyed your reviews of the book! I agree. Reading about how she still though all she needed was yet another man, just better, made me mad, too. Which was one of the reasons I liked the quote. She just will never learn! I enjoyed reading yours, as well! That last quote absolutely sums up the novel and probably the reason why Emma’s fate was so tragic. She believed that finding a strong and handsome man would complete her and make her happy, but she never once looked to herself as the maker of her own happiness. And to this day lots of people are still making the same mistake, which is probably why this book is a classic! I’m listening to the Bad Timing video while I read your post. I loved that quote too! I never thought about the balance between being grateful for what you have, but still having hope and dreams. This read-along has been so great for different perspectives of the book. As for Emma, I think she’s the kind of person who attracts drama and is never satisfied with her lot in life. I think hearing the different perspectives was the best part about the read-along! I am so woefully behind…but still reading. I’ve loved your posts during this read-along! Did you know they are working on the film version right now? It will star the same actress who was in Jane Eyre. I didn’t know that. What a different role that will be for her! I’ll be interested in seeing it. Keep on reading! I am interested in hearing what you think! I like that last quote, kind of gives meaning to that book and makes you think. I agree, and I think it’s still so relevant.